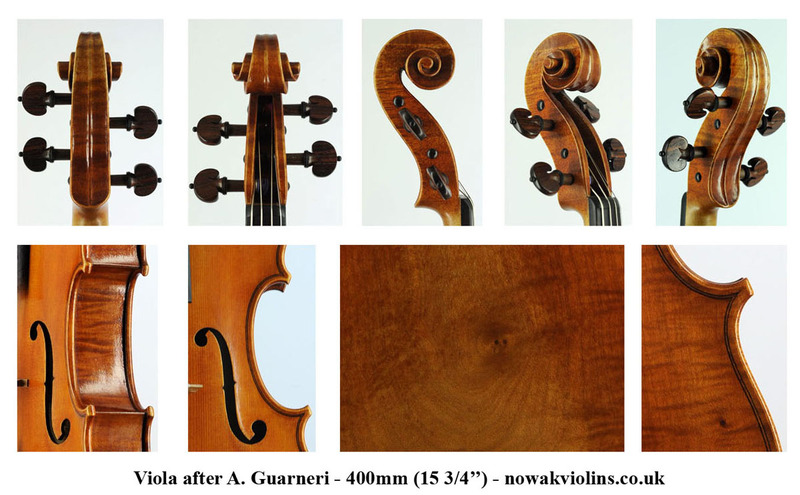 Here a different interpretation of an Andrea Guarneri Viola, this one slightly smaller than the masters well known contra altos, but nevertheless a good size, with a proportional shorter string and neck length, suitable for most hands. 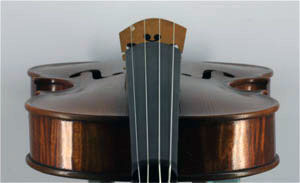 I love to use a variation of suitable tonewoods for my instruments, most is 'perfect', others occasionally unusual for perhaps the modern taste. But the old masters were also able to achieve stunning results with the less then perfect wood, and to interpret these creations one must be bold ! There are many instruments surviving from the Italian school displaying knots in their tonewood, and even Stradivari and other first rank Cremonese makers did use such pieces. 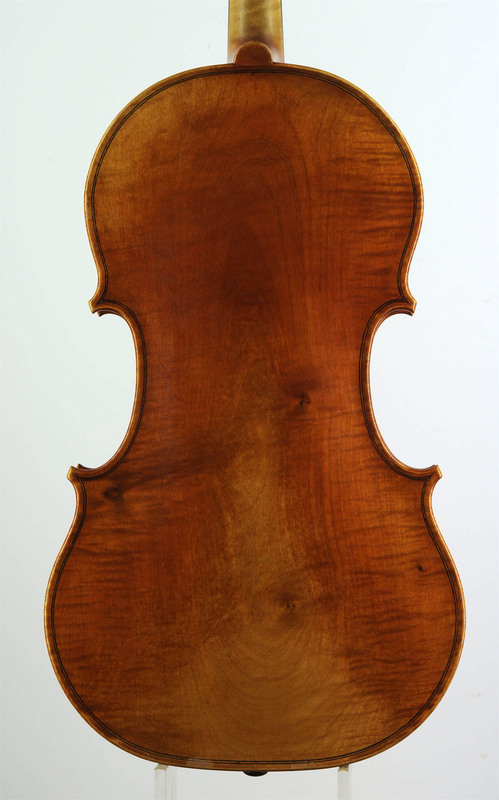 This viola's one piece Alpine spruce front seasoned for over 30 years and came from the stock of the late David Rubio of Cambridge, and I was just waiting for the suitable model to use it. It is complemented by a shimmering rippled sycamore back cut on the slab, which I converted myself in 1994 - how time flies. Again there are a few small feature knots in it, but not anywhere near the soundpost, and their visual appeal underneath the varnish is just striking. A gentle tilt of the instrument to catch the light in a different angle and its like little cats eyes blinking. 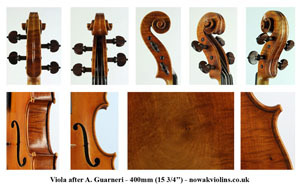 So how to varnish a viola like this? 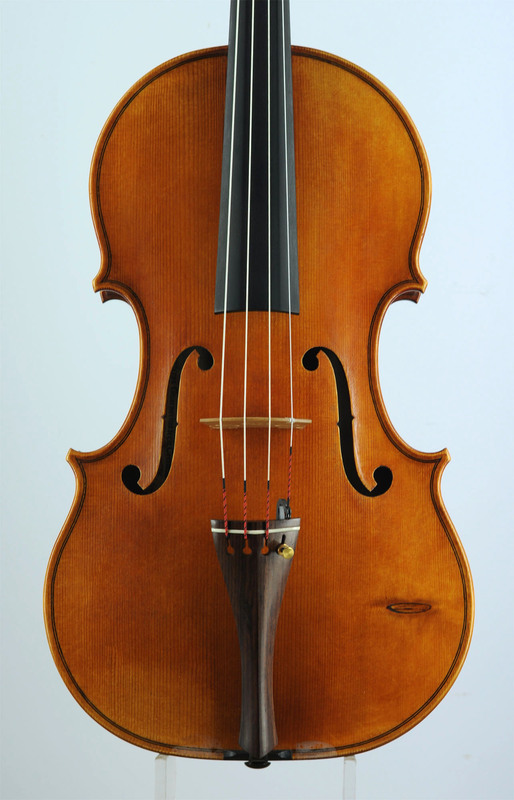 Many modern makers no doubt would distress it so much to try and give it a look of perhaps 200 or 300 years alleged hard use, perhaps to 'fool' the casual observer or to justify the material choice. 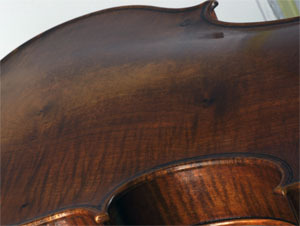 But I don't think there is much aesthetic value in a scratch - even less in 100 scratches, however 'artistically' applied. What I like to call my 'shaded and patinated varnish method' is to hint of things to come: a warm oxidized but reflective ground, an oil-resin varnish of my own recipe (based on classical formulas), the colour rich and transparent, and the shaded surface with some subtle craquele and a light dusting of patina. You will need to look carefully in the right light to appreciate the subtleties of such a finish, under an overcast light the natural surface texture might even look a bit dull (much like original unpolished classical varnish examples), but allow a beam of light to strike its surface and reflect from underneath and you can see a range of hues and colours not thought of before. 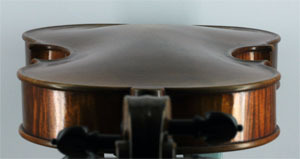 The varnish will wear gently over time, and this will blend in with the existing finish, and so the first (and second and third) owner will have an original instrument, maybe another classic in the future, but always a good sounding and well made instrument to give pleasure as well as a working tool for the musician. 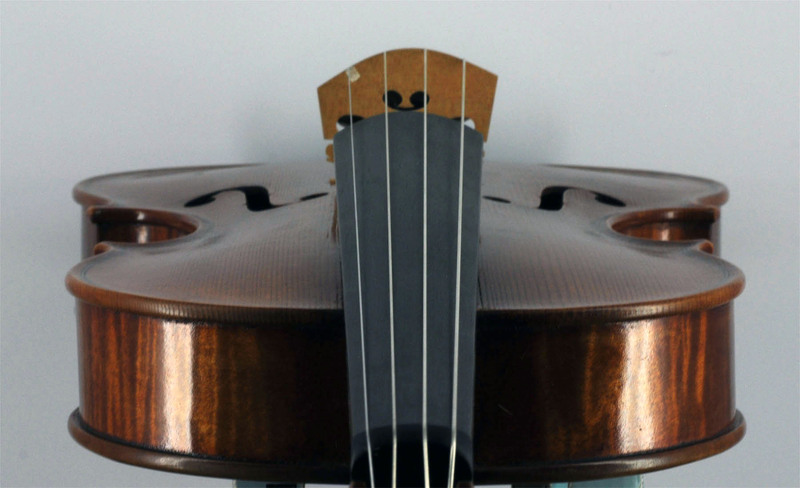 The sound is warm, resonant and projective and will no doubt develop further once played for a little while.